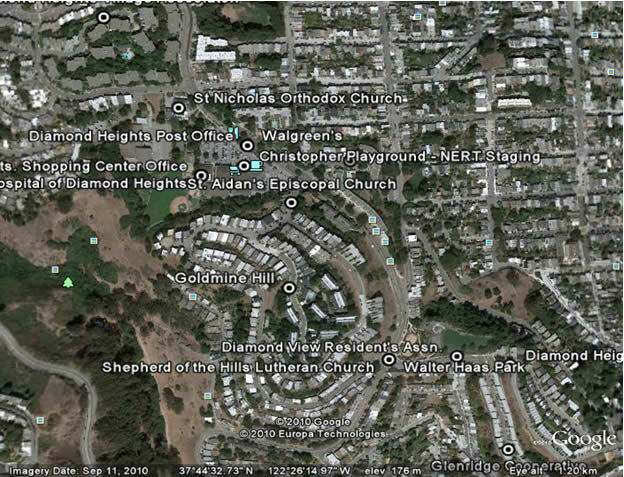 St. Aidan's is at 101 Gold Mine Drive at Diamond Heights Blvd at the South end of the Safeway parking lot. St. Aidan’s has been established as an area where people and families can register and learn disaster resources as resources become available. Jensen’s Mail & Copy in the Diamond Heights Shopping Center will post information as well for the community. The staging area is at Christopher Park (near Duncan and Diamond Heights Blvd). Team members will access injuries and structural damage in Diamond Heights and work toward solutions under the direction of the San Francisco Fire Department. Seriously injured persons may be sent to St. Luke’s Hospital @ Caesar Chavez and Valencia Street. Person with minor injuries and those requiring minor first aid should be treated where they are if possible. The closest City Health Center - Mission Health Center (Health Center #1) 3850 17th Street @ Noe (415) 934-7700, may be in operation.